What if Time Travel were real? What if Time Travelers from 300 years in the future told you that there was a chance that you could prevent catastrophic climate change, plagues, and wars by going back in time to key Pivot Points and ethically altering the outcome of rigged elections? What if failure would result in the destruction of the biosphere? Would you go? The fate of Earth’s biosphere falls squarely on the shoulders of Tara, Leona, Janus, and Tara’s small gray cat, Georgie, who shows a surprising aptitude for telepathy. Time is short to reverse catastrophe that will bleed through into the alternate Timeline, and the Time Travelers must first determine the ideal Pivot Points by reading Time Code vibrations off the great standing stones of Avebury. Unexpectedly joined by the brave and wise cat Georgie, the six plunge into the Time Circle of Stonehenge on their mission. Where and when will they go, and will they succeed in restoring the Earth and humanity to balance? Debra Denker has been writing stories since she learned to read. Although novels and poetry were her first loves, she turned her talent to journalism in the ‘70s and ‘80s, writing about Afghanistan and the refugee situation in Pakistan for National Geographic and many leading newspapers. She has specialized in social documentation utilizing journalism, photography, and film to convey the experiences of people in war torn areas, with the intention of stimulating the empathy necessary for humans to stop violence against people and planet. Denker is the author of two published books, the non-fiction literary memoir Sisters on the Bridge of Fire: One Woman’s Journeys in Afghanistan, Pakistan, and India, and the novel War in the Land of Cain—a story of love, war, and moral choices set during the Soviet-Afghan war of the 1980’s. Denker now writes for the award-winning conservation media website, Voices for Biodiversity, raising consciousness to help ward off the Sixth Great Extinction. She currently lives in Santa Fe with her family of cats, Dorjee Purr-ba, Yeshe Gyalpo, and Samadhi Timewalker, but travels frequently in earthly space, and hopes to travel in time and galactic space. The novel’s website is www.weathermenders.com. Her personal blog www.mysticresistance.com explores a range of spiritual, social, and political issues and their intersection with sacred activism. I autograph a lot of copies of Weather Menders with the words, “In hopes of changing the dream, in time.” That’s because Weather Menders, rather than being a dystopian novel about the horrors of climate change that seem imminent, ultimately is about changing the dream we are living in from a nightmarish scenario to a vision of hope, regeneration, and healing of both climate and social systems. Cli-fi—climate change fiction—is a relatively new genre, a creative literary response to the unprecedentedly rapid alteration of climatic patterns, the defining planet-wide crisis of our times. How do humans cope when the cycle of seasons of our childhoods—even the childhoods of those now in their teens and 20s—is completely disrupted by the extremes increasing year by year, season by season? Cli-fi can be about the distant future, a probable near future, or, increasingly, the present. The term was coined by journalist and teacher Dan Bloom after he read the 2006 IPCC (Intergovernmental Panel on Climate Change) report. The term began to gain prominence in 2013 after NPR ran a story on it, interviewing authors but neglecting to mention the name of the person who first came up with it. I didn’t realize I was writing cli-fi until on a late night perambulation through the internet I came upon the term by accident or synchronicity. I had finished a draft of Weather Menders and considered it either soft sci-fi, because of the time travel element, or magical realism. When I read the NPR story and Bloom’s Cli-Fi Report, I realized that my novel also fit into this cutting-edge new genre—still so new that most indie booksellers I have approached have not yet heard of it. A lot of cli-fi novels are dystopian, and that approach, like horror films and thrillers, appeals to lots of people. But not to me. Reading the news is bad enough. I remembered the 1975 novel Ecotopia, by Ernest Callenbach. The book is a fictional journalist’s account set in 1999 about a new country living in harmony with Mother Earth after Washington, Oregon, and northern California seceded from the U.S. Isn’t it better to envision a different, better world’s alternate reality than to dwell on the negative and stoke the fear of how really bad things can get? That’s when I began to imagine time travel as a fictional solution, a story that could entertain readers while waking them up to both the dangers of climate change and potential solutions. 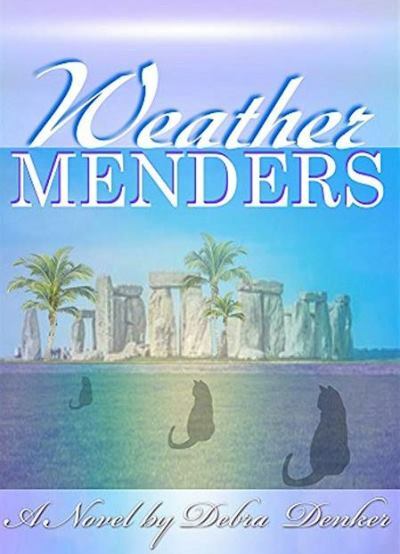 Although Weather Menders starts out in a dystopian, vastly warmer, post-plague 2050 Britain, where palm trees tower over Stonehenge, time travel allows for changing the dream—but you’ll have to read the book to find out how, and if they succeed. My training as an energy healer and my participation in double-blind controlled scientific studies into consciousness and Distant Healing led me to believe that we do have the collective power to “change the dream.” Buddhism, Hinduism, and the mystic aspects of all spiritual traditions see the world as a dream, an illusion. If we are living in an agreed-upon reality, then it is possible to change that reality through focused intentionality—prayer, visualization, meditation. All the better if a large group, organized or spontaneous, shares the same intention. We have the power to change the future from a dystopian nightmare to an ecotopian dream of an altered probable future—both in literature and reality. The story of Weather Menders began to come to me in the spring of 2013, in bits and pieces. A character here, a plot point there. The story began to fill in when I visited England and Scotland in the brutally hot summer of 2013. As I joined a small group in ceremonial prayers for the Earth at dawn inside the circle of Stonehenge on the Mayan Day Out of Time, I felt that I heard the voices of ancestors and the voices of the future. Stonehenge, I sensed, was more than a calendar—it was truly a portal into other times and dimensions. I wondered what time period we would have to go back to in order to prevent climate change. I studied and researched, and used my intuition as well, to come up with the two crucial time periods that feature in the novel (you’ll have to read it to find out what those are). I started thinking that if I and friends close to my age were still alive in 2050, an oft-quoted watershed year for climate change, how old would we be? Most of us would be in our 90’s by then. How would we feel if climate change had continued unabated? The character of 96-year-old Tara, sitting with her back against the cool black stones of Avebury on a steamy September day, came alive for me. And then her cat started talking to her, right on page 1. 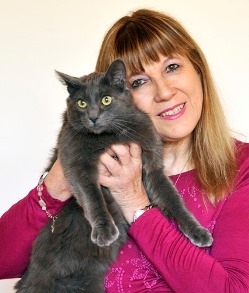 As an Animal Communicator, I “mindtalk” to animals, especially cats, dogs, and horses, on an almost daily basis. So the idea of a wise telepathic talking cat is not at all far-fetched to me. And as if reading my mind, on Christmas Eve, 2016, a short-haired gray cat mysteriously appeared outside my door in the snow, in a rural area outside Santa Fe that is home to numerous coyotes and bobcats. Part of me wondered if he really was Georgie the time-traveling cat from 2050. Within three weeks he had wrapped me around his little gray paw. The deal was clinched when Sammy (short for Samadhi Timewalker) jumped on a client who had come for an energy healing session and put his paws right on her heart. I knew then that Weather Menders had to reach out to the world, that there was some sort of magic and synchronicity involved. Whether or not you believe time travel is real, there is considerable evidence that our thoughts, individual and collective, can change the present and future. Enough of dwelling on fear of the future. Let’s change it instead. Recently I’ve been inspired by Greta Thunberg, the 16-year-old Swedish high school student who started the first “school strike” for climate action and has urged students worldwide to join the movement. Thunberg has become a passionate spokesperson for climate healing, overcoming Asperger’s and selective mutism to speak at venues like the UN Climate Change Conference in Poland and the World Economic Forum in Davos, Switzerland, journeying by train and camping out in the cold. She knows that it is her generation that will face the catastrophic consequences of climate change if we don’t take immediate, focused, worldwide positive action. She has not given up hope. Neither have I. And, I pray, neither will you. Change the dream. Together. Now. 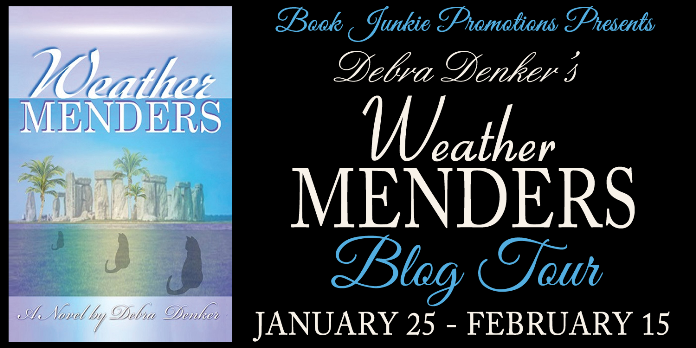 During the Blog Tour we will be giving away two paperback copies of Weather Menders! To enter, please use the Gleam form below. – Giveaway is open to US/UK/CANADA. Now That's Just Stupid - Weight What? Book Blitz for Kissing Magic by Day Leitao! Valentine's Countdown Blitz Day 15! Valentine's Countdown Blitz Day 14! Valentine's Countdown Blitz Day 13! Valentine's Countdown Blitz Day 12! Valentine's Countdown Blitz Day 11! Innocence Lost by Sherilyn Decter Blog Tour! Parabellum by Jack Nanuq Book Blitz! Valentine Countdown Blitz Day 10! Valentine Countdown Blitz Day 9! After the Rain by Brandy Bruce Blog Tour! Valentine Countdown Blitz Day 8! Valentine Countdown Blitz Day 7! Valentine Countdown Blitz Day 6!